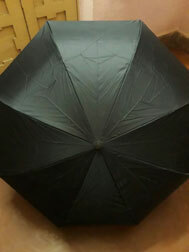 As the name suggest the umbrella once opened becomes normal from outside with the black water proof fabric inside and you have the choice of another fabric as per the designs and colors shown below. The button near the stylish handle ensures that the umbrella is locked both way either when in use or when folded back for easy maneuverability. The handle resembles alphabet ‘C’ and is also known as inverted umbrella. 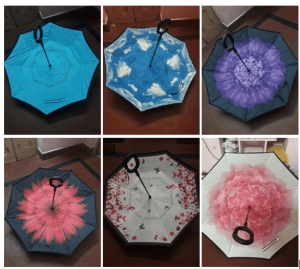 The double layer adds to the look of the umbrella when not in use by adding glamour when you move around with it during the rainy season or to protect yourself against the harsh sunlight. We have standard size of 42 inches in ready stocks of nine varieties as per the brochure above for your selection. The samples can be shown to you to make it easy for the team to decide on the high utility item. 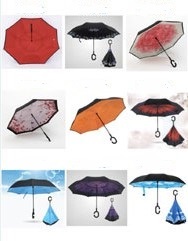 The various designs are red, black, sky blue, sky colour with clouds when you look inside the umbrella, flower shapes in red with black, violet with black, white and pink combinations. An ideal gift for your high-end esteem customers with built in utility to pleasantly surprise them. Please do write to us for more such innovative promotional gift ideas to us to achieve your objectives of either increasing sales, impressing your associates, pampering your employees or for meaningfully influencing your major influencers.